The three main types of rubric (standard, custom, and qualitative) in Turnitin are made up of three elements: rubric criteria, rubric scales, and rubric descriptors. Rubric criteria are the characteristics against which submissions will be assessed. For instance, students may be assessed on things such as subject knowledge, spelling and grammar, development and ideas, presentation, etc. The criteria are found on the left hand side of the rubric. Scales in GradeMark provide a level of achievement for the related criteria which have been outlined in the rubric. As a simple example, a scale could simply be ‘very poor, poor, average, good, very good’. 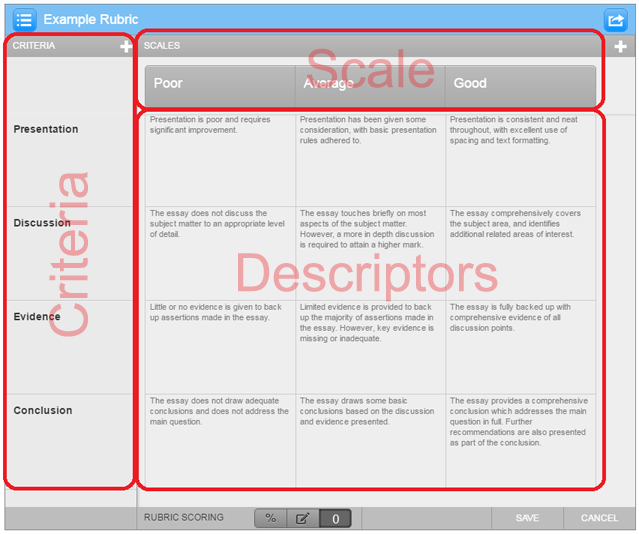 The rubric scale is found along the top of the rubric. The descriptor is the element of the rubric which ties the criteria rows and scale columns together. The descriptor can be thought of as the part of the rubric which describes what a student must do in order to meet each specific scale for each given criteria. The descriptors can be found in the main body of the rubric. The marker selects the relevant scale item for each given criteria. 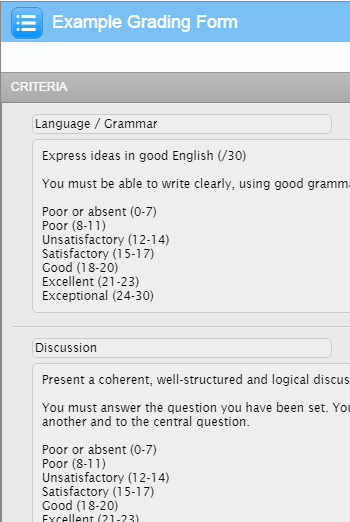 Grading forms in Turnitin can be thought of as very simple rubrics. There are no scale items on grading forms. Instead, they consist simply of a number of criteria which students can be marked on.